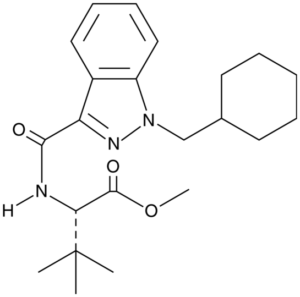 MDMB-CHMINACA (also known as MDMB(N)-CHM) is an indazole-based synthetic cannabinoid that acts as a potent agonist of the CB1 receptor and has been sold online as a designer drug. It is closely related to MDMB-FUBINACA, which caused at least 1000 hospitalizations and 40 deaths in Russia as consequence of intoxication. 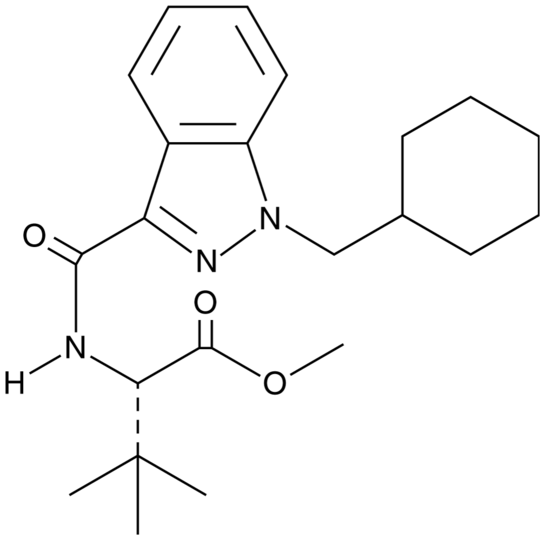 AB-CHMINACA is an indazole-based synthetic cannabinoid (CB) that is structurally related to AB-FUBINACA, a high affinity ligand of the central CB1 receptor (Ki = 0.9 nM), by having a cyclohexyl group substituted for the 4-fluorophenyl group.1,2 MDMB-CHMINACA is structurally related to AB-CHMINACA by bearing a similar cyclohexyl group; however, the terminal aminocarbonyl moiety is replaced by a methyl ester group and the isobutyl moiety is substituted with a tert-butyl group.2 The physiological and toxicological properties of this compound have not been determined. This product is intended for research and forensic applications. MDMB-CHMINACA is a Fifth Schedule of the Misuse of Drugs Act (MDA) controlled substance in Singapore as of May 2015. MDMB-CHMINACA is illegal in Switzerland as of December 2015.